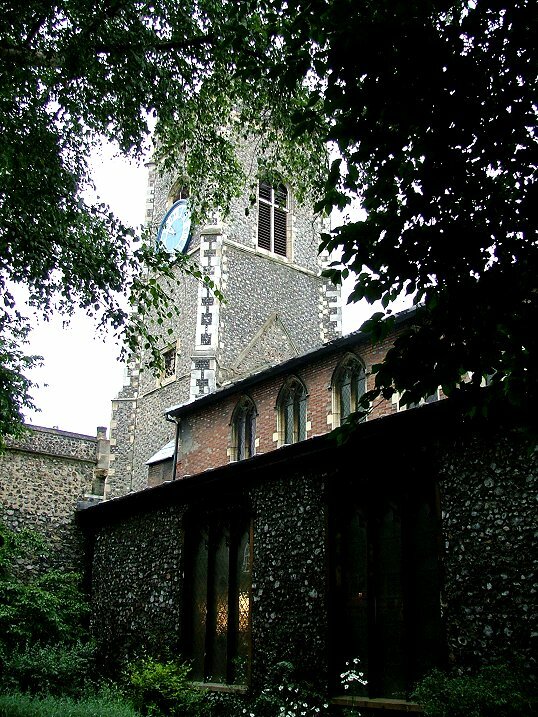 This is as pretty a church as you'll find in Norwich, and the setting is unsurpassed. 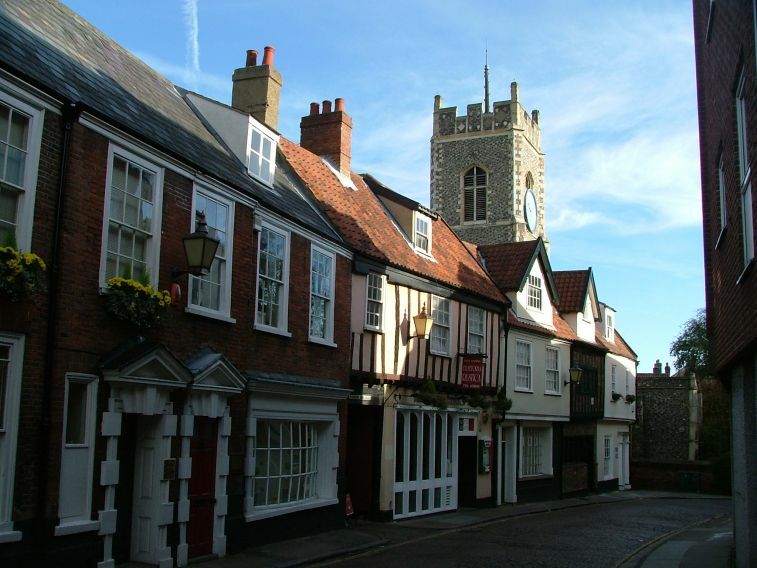 Hemmed in by restored 17th and 18th century houses, the church is set back in one corner of the city's famous Tombland, just across the road from the Cathedral of the Great and Undivided Holy Trinity. 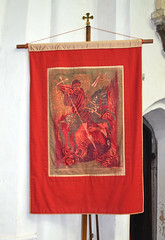 Indeed, the church was once known as St George at Trinity Gate. If you approach the church from Princes Street, the cathedral spire appears unnervingly as if it is a little spirelet at the top of St George. 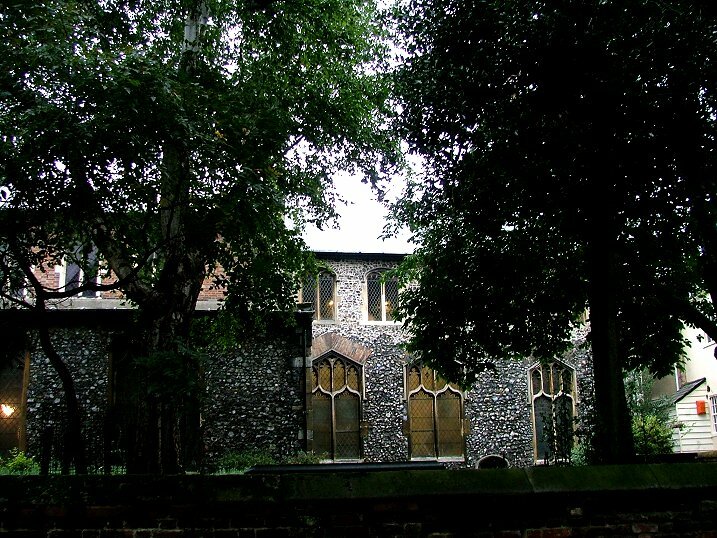 As you reach it, you find it set back behind mature trees, tight in its little graveyard. 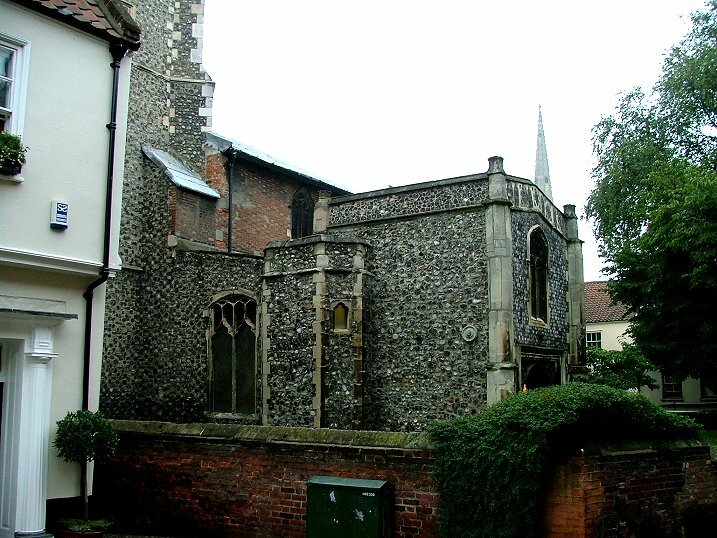 Bequests from the tower date from the early part of the 15th century, and the rest is probably broadly contemporary. 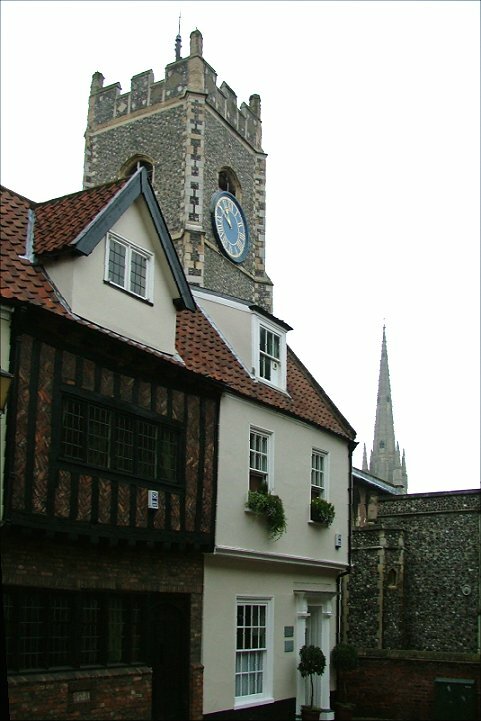 The very top of the tower is a 17th century repair in the Gothic tradition. 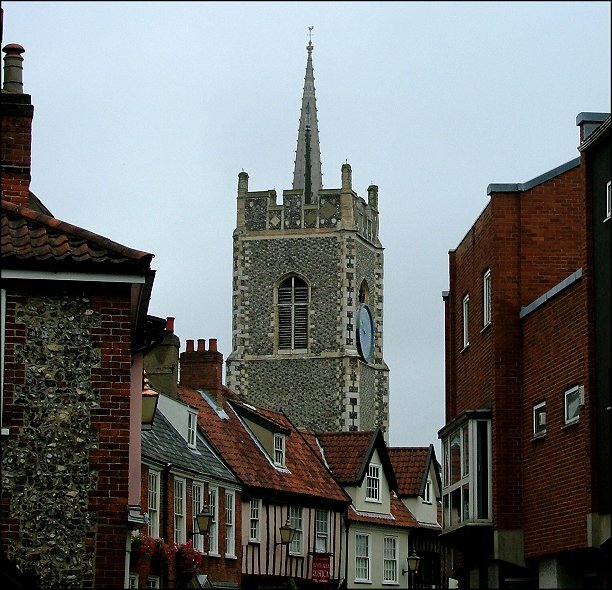 Coming from low church Suffolk, St George appears exotic to my eyes, because it is one one of the highest rungs of the Anglo-catholic ladder. Statues and stations abound, and both aisles end in the east at Marian altars. 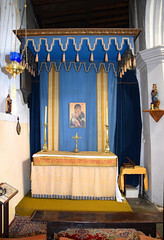 The furnishings are largely 19th century, but the chancel retains its gorgeous 18th century reredos, which is fitting in a city which was at the height of its power and influence at that time. Also 18th century is the pulpit with its high tester, both elegant and awe-inspiring. 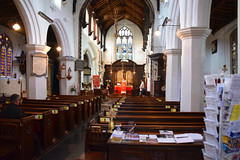 The font cover is a hundred years earlier, the St George and the dragon motif on its top a hundred years later. The font itself is an arcaded job in Purbeck marble, familiar from hundreds of rural East Anglian churches. This one has been urbanised by enthusiastic Victorians, placed on grand marble pillars. 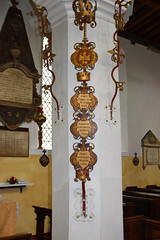 Despite being a small church in a small parish, St George has provided its fair share of mayors, and in common with many other city churches retains its sword and mace holders in the north aisle, decorated with some of their names. There is also a good range of fairly impressive memorials. 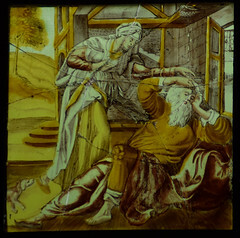 But perhaps the best features are in glass, five centuries apart. 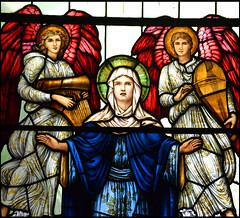 At the east end of the south aisle is a lovely window of 1937, a late work of the William Morris workshop depicting the Blessed Virgin at the Magnificat flanked by angel musicians. 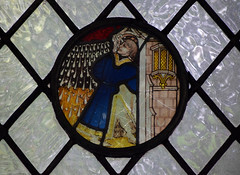 The artist was WH Knight, the angels drawn from Burne Jones cartoons. You can see a detail from it at the start of this piece. Further west in the same aisle there is a 16th Century roundel from a domestic Labours of the Months sequence. It depicts April, the rich man impatiently dodging the rain that prevents him getting on with his farming. 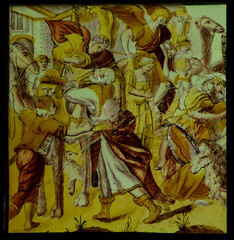 Across the church, high up in the north aisle, are two Flemish panels depicting scenes from the story of Tobit. 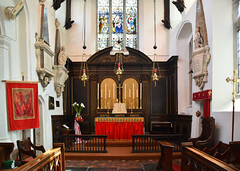 St George has two notable early 17th century memorials. 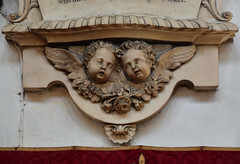 Up in the chancel is the marvellously named Alderman Anguish. 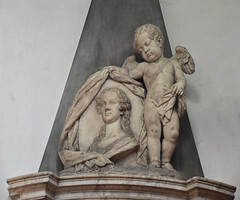 His monument is by Nicholas Stone. It is highly coloured, and he kneels opposite his wife, their family living and dead around them. Another former mayor is remembered at the west end. 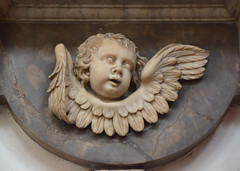 John Symonds died in 1609, and left unto the poore of this parish two shillings a week to be continued forever. Well, ten pence won't go far these days, but if you are one of the Tombland poor you might consider looking on the shelf below it, for this is the original dole table on which charity payments may be made. A recent review on facebook describes the church as Catholic, traditional, liberal, friendly, easy-going, woman-friendly, man-friendly, gay-friendly, generous-spirited, prayerful, unfussy, which in my experience of the church is exactly right. 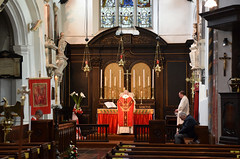 I was most recently here on the Feast of St Philip and St James in 2017, which happened to be during the Flintspiration festival, but Mass went ahead as usual, the verger at the back welcoming people in to either carry on looking around during Mass or to sit and listen to it, as they wished. Afterwards, it was a pleasure to chat with the cheery verger and the friendly parish priest, and if I am honest it was also a pleasure to have my name recognised. But they were equally lovely to me before that happened.